The ball is teed up for what should be an outstanding Great Basin Conference boys’ soccer game when the league-leading Wood River High School Wolverines entertain chief challenger Jerome on Thursday. Both teams were unbeaten after last weekend’s action and no other team in the six-school league is close to the leaders. Coach Luis Monjaras’ Wood River team (5-0-4, 5-0-1 league) sparked by a fierce defense that has allowed only five goals in nine games will try to keep its lead over coach Robert Garcia’s powerful Tigers (6-0-4, 3-0-3). The teams tied 2-2 at Jerome Sept. 4 and will be vying for the regular-season GBC title and homefield advantage in the league tourney starting Oct. 4. Wood River kept its unbeaten boast alive by earning a come-from-behind 2-2 draw against the 5A Highland Rams (5-1-4) in Pocatello Saturday. 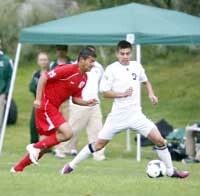 The Rams were coming off their first loss, 4-0 to Skyline in Idaho Falls on Thursday. Highland scored in the fourth and eighth minutes on “two big mistakes by us,” Monjaras said. Junior Andrew Graves converted a direct kick at 18 minutes and junior Zac Miczulski scored his first goal at 68 minutes for the tie. Last Thursday, Wood River posted its sixth shutout in eight games 1-0 at Burley (2-6-2, 1-3-2) on senior Zack Freeman’s goal in the 47th minute. Graves took a direct kick and Freeman made good contact on a header. Wood River, which hosted Canyon Ridge (3-4-2, 2-3-1) on Tuesday, has its “Senior Night” against 5A Madison Bobcats Saturday, Sept. 22 at 11 a.m. on the Hailey high school field. After dropping their first home game of the season to 5A Highland of Pocatello 5-2 Saturday, the Wood River girls’ soccer team (6-3-0, 5-1-0 league) went on the road for three Homecoming Week games. Wood River visited Canyon Ridge (3-4-1, 3-2-1 league) Tuesday and goes to Jerome (3-5-1, 2-3-1) on Thursday. On Saturday the Wolverines travel to Rexburg for their first meeting since 1996 with the 5A Madison Bobcats (4-3-1), a 5-0 loser to Highland back on Sept. 8.
shots to keep Hailey close. “I’m so proud of our goalie,” Wood River coach Jenni Conrad said. Samantha Sutton scored the first goal on a nice header off a Allison Gasenica corner kick at five minutes. Highland’s fleet forward Makenzie Van Sickle tallied the first of her two goals in the first half for a 1-1 game. Haley Montgomery one-timed a nice shot from 22 yards, and the score was 2-2 at intermission. Highland’s dangerous offense had the wind at its back after the half and took advantage, out-shooting Wood River 8-1 (17-6 for the game) and scoring three times—on goals by Reece Bauer, Jamiece Yizar (header) and Katie Denney. Thursday, Wood River had no trouble winning 11-0 over visiting Burley (1-8-1, 0-5-1). The Wolverines out-shot Burley 17-0 in the first half—Grace Eagan and Allison Gasenica scoring two goals apiece in the first half when Wood River went up 8-0. Montgomery and Lucy Brannon each scored twice. Samantha Sutton scored the game’s first goal, Tayte Kelly added a single and Brigette Thomas buried a penalty kick. Assists went to Megan Murphy, Sutton, Allison Gasenica, Montgomery and Brannon.